For flap type turbines the sail power can be calculated in terms of TPR (TIP POWER RATIO) s defined in here. We first assumed that the sail of the flap-turbine is sum of infinite number of Pelton turbine buckets. These buckets made of long strips with infinitismall thickness. The strips are parallel to rotation axis of the flap-turbine. 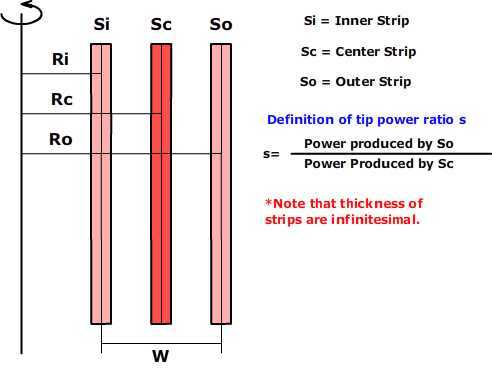 Then we defined the TIP POWER RATIO s as the ratio of the power produced at the tip strip to the center strip. Since these strips are parallel to rotation axis as shown in the following figure and their thickness are infinitesimal, it is safe to assume that the sail velocity along a strip is not changing. However each strip has different velocity depending on the location on the sail. While strips away and outward from the center strip moving faster than the center strip, inner ones move slower. 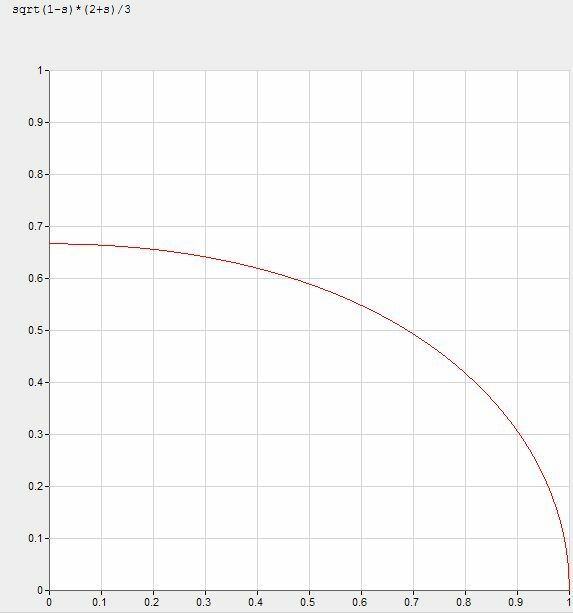 Power produced on any Pelton strip can be found from equation given below. Where Vw is the wind speed and U is the sail strip velocity which is assumed constant along the strip. Here ρ is the density of the air in that location, and ΔQ is the volume rate of air acting on the infinitisimal strip. Well know power formula for wind turbine is given as. Substituting equation (5) into equation for and decreasing the thickness ot the strip further we get following differential equation. The Plot 2 given below shows the ratio of power extracted by the turbine, to the power available in the wind. This ratio is called as absolute power ratio. When s is decreesed from 1 the extractable power increases sharply. When s is decreased below 0.5 the power increase is not as drastic. Even if we get s to zero, maximum extractable power can not exceed two thirds of available wind power. Note that for drag type turbines almost all the people use the power available in the wind in their calculation. The plot given above shows that this is not possible. The best case you can reach is two thirds of the available power. In light of the equations given above with their corresponding plots one can find the desired flap type wind turbine design. To assist people who want to do this kind calculation I prepared following flash animation. By changing, distance from rotation center to sail center Rc, the sail height h, the wind speed Vw and Tip Power Ratio ( aka TPR ) s in green box, one can find desired wind turbine for their specific needs. The power can be extracted from the wind for a given design can be found inside the red box at top left corner of the animation. We should emphasize that these calculation should not be used for any other drag type wind turbines. By opening its flaps on up moving sail, the flap-turbine becomes almost like a Pelton turbine. However any other drag type turbines which does not have opening flaps, creates so much resistance during up movement, the resembles to Pelton is eliminated. These type turbines, especially Savonius are so inefficient that one should never consider building one.